"Meet the Bayou's baddest good ol' boy." 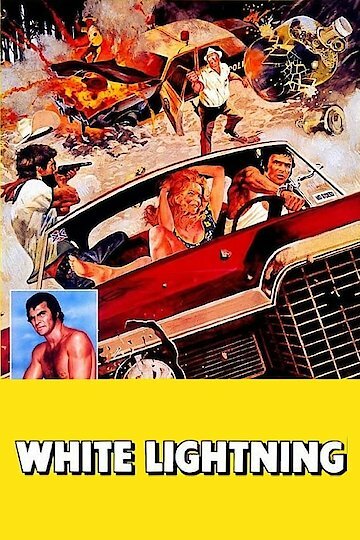 Directed by Joseph Sargent and written by William W. Norton, White Lightning is an American action film starring Burt Reynolds, Jennifer Billingsley, Diane Ladd, Ned Beatty, R.G. Armstrong, and Bo Hopkins. The music for the film was written by Charles Bernstein who also wrote the music for A Nightmare on Elm Street. While currently serving time in an Arkansas prison for illegally running moonshine, Bobby Gator McKluskey (Reynolds) learns his brother Donny was murdered. Sheriff J.C. Connors (Beatty) is behind the murder. When Gator finds out the sheriff is currently taking money from local area moonshiners he agrees to expose the sheriff and go undercover for the Feds. Big Bear (Armstrong) the sheriff's enforcer is sent after Gator when the sheriff realizes that Gator is currently working for the Feds. White Lightning is currently available to watch and stream, buy on demand at Vudu, Google Play, iTunes, YouTube VOD online.